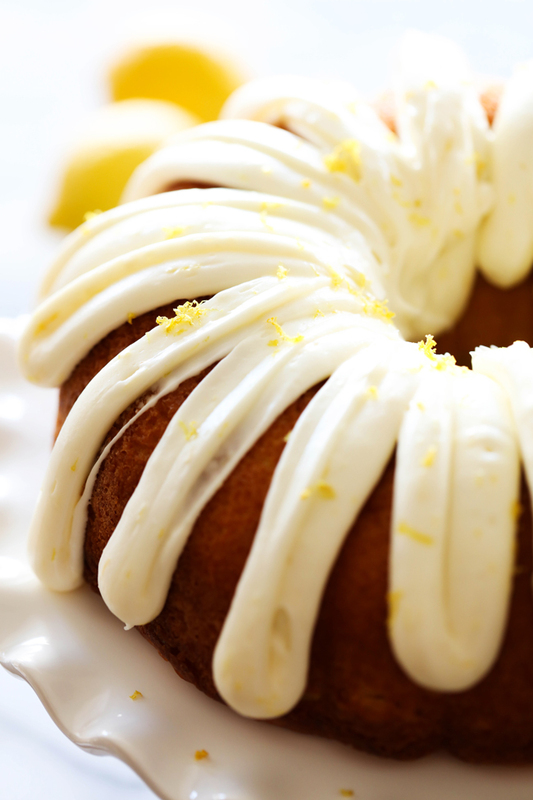 The Lemon Bundt Cake is bursting with refreshing and delicious flavor! It will be one of the moistest cakes you ever have the pleasure of trying! The frosting is AMAZING! Spring time is here and so are my lemon cravings! This Lemon Bundt Cake will be one of the most moistest cakes you will EVER try! It is fabulous! This cake is bursting with divine and refreshing lemon flavor and is complimented with a rich and amazing lemon cream cheese frosting. If you are looking for a dessert to wow a crowd, give this one a try! You will not regret it! In a large bowl, mix all ingredients together for 3 minutes on high. Pour into a greased bundt pan. Bake for 45-50 minutes or until a toothpick comes out clean. Let sit in pan for 5 minutes, then invert onto a cooling rack. While cake is cooling make frosting. In a medium bowl combine cream cheese, powdered sugar, lemon zest and lemon juice and beat on high until creamy. Scoop frosting into a large ziplock bag and cut a hole in the corner of the bag, you can also use a piping bag with a large round tip as well. When cake is cooled, pipe the frosting over the top of the cake. Garnish with more lemon zest if desired. Cakes are so much better when they look pretty too! I love lemon cakes, this sounds delicious. This looks wonderful. What size box cake mix would you use? Depending on the brand they are different sizes. Is the pudding mix the instant kind or the cook and serve pudding? This looks like a nice moist cake and perfect for spring. I want to make it soon. That's my question exactly! They need to be more specific. I love bundt cakes. Yours are so gorgeous! My bundt pan is a dark non-stick pan. Should I adjust the oven temperature for this? What type of pan do you have? I baked mine in a convection oven for only 40 minutes and it was perfect. This is delicious. I'm not really a box cake kind of person, but this was quick and very good. Thanks for sharing. I just found your site tonight. Oh my goodness. The food looks delicious. I definitely will be putting some of these on my table. This is absolutely perfect! I made this yesterday for Mother's Day, and my family raved about it! I used the exact recipe, however, my oven is not regulated properly, so I preheated to 350, put the cake in, lowered to 325 immediately and baked for 50 minutes. Wow! Moist and delicious! The lemon flavor is perfect. Do you think I can use the same recipe with chocolate cake mix? Without the lemon of course. This looks wonderful! I wonder if I could add blueberries to it? I make this same cake, but I use a glaze on top. Use powder sugar and lemon juice and zest and pour over cooled cake. This cake was a huge hit at my "summer solstice" party last night! Truly moist and delicious! In the US, our boxed cake mixes are 15.25 oz or 432 g.
Don't think 5 minutes is long enough to sit in pan....half mine stayed in pan when inverted! Also not enough frosting to do what is shown in picture. Got half way around, thinking I could cover my messy cake, and ran out of frosting. Not a happy camper ? Sorry... I should have added to post that I use many of your posted recipes and love them. Thank you! Delish!!! So moist and the icing is yummy!!! My cake was so nice and tall when I took it out of the oven. After it cooked for 5 minutes, it was half the size it was to begin with. Now it is only about 2 inches tall. Isn't it supposed to be taller than that? After it cooled, not cooked. Just made the cake and experienced the same thing. It was perfect, until it sat for a few minutes and completely deflated... hoping it tastes better than it looks! I made this today ahead of time for Easter and followed the directions exactly. I also had the cake deflate cooling in the pan. It still looks okay and I am hoping it still should taste good. If so I will make it again but in a 9 x 13 or cupcakes. I think it’s something with the ingredients that causes it to fall. My cake came out of the oven looking beautiful, then fell as it was cooling. Any idea what I did wrong? Could I subsitute oranges for the lemon with the same results? Would oranges be ok instead of lemons? I made this on Christmas Eve and we all loved it! It was moist and delicious. I loved the icing. I made this cake for New Years! It was awesome! I used the mix I had in my pantry that already had pudding in the mix. It still turned out moist and delicious! And yes that frosting is AMAZING. It tastes like those lemon drop candies. Oh my goodness, this looks absolutely amazing! I can't wait to give this recipe a try. Thanks for sharing! I made this for our anniversary and it was delicious. I did change one thing though, I used a lemon pudding mix in place of the vanilla pudding mix. This is the best lemon cake that I have ever eaten. Although the cake deflated upon cooling for a few minutes, the taste was fantastic! This was a winner at the Super Bowl party. It's so moist, tasty and easy to make. The kids loved the flavor and I'll definitely be baking it again soon! I made this cake last year for a "Pinterest" girls party and thought I had left a comment. This cake was one of best cakes I have ever made. It turned out perfect. I am having friends over in a few days and planning to make it again. I hope that it's just as wonderful as the first time. Thank you so much for sharing this awesome recipe. My coworkers wife passed away and we fed his family after the funeral. I was in charge of desserts and was hesitant to make this since it was a new recipe. I did it anyways and was so glad I did. He called me that night to say thank you and said that this cake was the best cake he ever had. I didn't get to try the cake but I will definitely be making this again! I made this for a cookout this weekend. My cake fell. I've never in my life had a cake fall!! Thought it was a fluke so I stopped by the store and got the ingredients to try it again. I added a few minutes to the cooking time thinking that would help. Nope!! The second cake is even thinner than the first!! Great flavor but they look terrible!!! I will not make this again. Can I substitute butter for the oil ? I made this in a 9 x 13 pan because I didn't have a Bundt pan and adjusted the time. At 30 min I checked it and it was a flop with dark edges. Had to throw it away. I enjoyed this cake so much! Thank you for sharing! I made this for Easter and the whole family liked it. Thank you for the recipe! I made this cake for an Easter potluck and was amazed by it. None of the other deserts were touched. Even the kids chose it over the very cute birds nest cupcake. a small box of instant pudding is 1 oz. do I use 4 boxes? I made this cake for Easter brunch. I had to keep adding more powdered sugar to the frosting to make it stiff enough to pipe otherwise followed the recipe exactly. I came out with a lot of frosting and thought I made too much but my daughter said no, that was the best part. It was extremely moist and lemony. Everyone loved it! Hi , i would love to make your cake, i live in Ireland so i dont no what instant pudding is. can u please explain. thank you so much. "Pudding" in America is not a course at dinner (afters), it's essentially like a custard. A soft dessert eaten with a spoon. Available in many flavors - chocolate, vanilla, lemon, butterscotch, pistachio, and so on. I'm a lousy cook and it was delicious! Delicious. Came out of the pan perfectly. Way moist. Frosting delish. Makes a wonderful breakfast with coffee! Does this need to be refrigerated since it has cream cheese frosting? It appears she doesn't answer many questions and the questions that have been asked should have been covered in her intro. I would say [based on recipes I've made in the past, that the size of the pan would be 12 cup. Someone else asked about using butter instead of oil. I think the oil adds moistness to the batter and a slightly different texture where butter would not. Ghee would possibly be an option as long as it is liquid. Liquid coconut oil could work depending on the flavor desired. Cream cheese frosting should probably be refrigerated after a few hours. Instant pudding does not need to be cooked; box would say 'instant' on the front. For quantity of pudding mix [3.9 oz], four boxes 1 oz each might throw things off, but you could use a scale and weigh it. Not sure what could be done with the extra. Falling cakes - beating the batter too long or oven temperature is too high. Sticking - always oil the pan then dust it with flour or sugar/conf. sugar or cocoa. Be sure a pan spray contains flour and is for baking. If nothing else, do an internet search for your issue. Per my Google research, the falling cakes are likely due to the acidity in the lemon juice. Not sure if the ones who did not have falling cakes possibly used an artificial lemon juice that may have less acidity than fresh lemon juice (which is what I used). With the lemon cake mix, lemon pudding (substituted for the vanilla), and lemon zest, I'm going to try making it without the lemon juice to see if that keeps the integrity of the cake height but still has the great lemon flavor. I will report back! Tried this recipe yesterday and it was AMAZING! 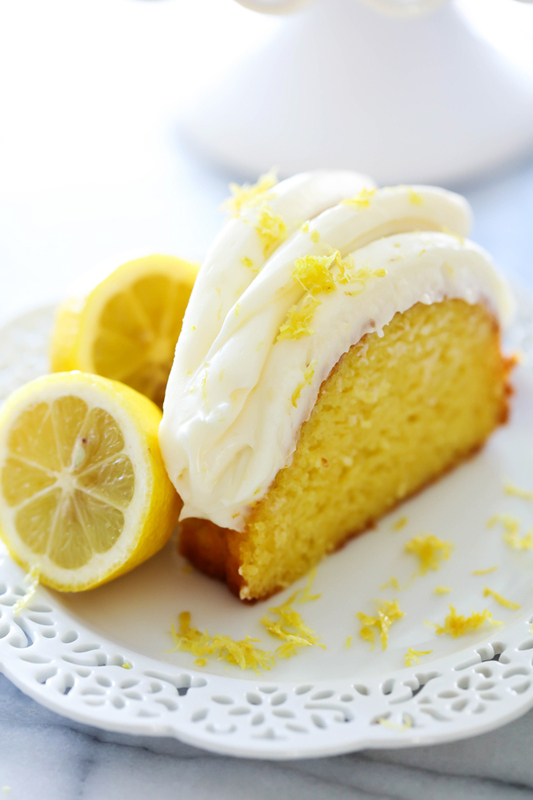 rich, moist and so lemony! I bake for our office staff and this is by far the most requested Bundt cake. Everyone loves it and it comes out perfect every time. I just pulled it out of the oven and it's absolutely beautiful. Mine has never fallen. I do add a 1/2 cup of butter and another cup of powdered sugar to the icing recipe, but that's the only think I tweak. This is my go to recipe! I made this cake for my daughter's birthday and It was so easy and delicious. Definitely will make again. Hi, if I canot get lemon cake mix, what can I do? I made this Lemon cake and it was so moist. I put lemon pudding instead if vanilla cause I wanted it to be real lemony. My husband took some to work and the guys couldn't believe that I made it. They said it was so delicious. Thank you for a great recipe. Had the same issue as several others, sunk horribly while cooling. I will not be making this one again. I made this cake tonight and it was fabulous! A perfect blend of sweetness and lemon. I forgot to take a pic before my hubby had a couple of pieces! I’m curious as to why so many people have made comments about their cake falling while cooling. The sad part is you never replied !! I really want to make this cake for my Aunts 80th Birthday but I don’t want a disaster so could you please answer this question ? Why do the cakes fall ? Thank you. Made it. It was delicious. I greased the bundt pan, but it still stuck. The directions should have said add flour and oil not just oil. I added extra lemon juice to the frosting.. it was a hit at our Easter gathering.. I've made this cake twice and it is one of our favorites! It's so moist and the cream cheese icing is literally the icing on the cake! Thanks for a fabulous recipe! Can I use instant lemon pudding or is the vanilla better. I absolutley LOVED this cake! It was a huge hit with my entire family. I mad one small change though, I used lemon pudding instead of vanilla pudding. Also, I was wondering if you could use this same recipe for a layer cake vs. a bundt cake? This cake is as easy as it is scrumptious! I first had some at work. I have since made it for my family for whom it has become a favorite. AWESOME CAKE! The pudding and the sour cream make this cake super moist! Love using a boxed cake mix as a base! I would not change a thing! Thanks for sharing! When I first made this cake mine fell also, the key is to add the eggs one at a time. It came out perfect the next time. I made this yesterday for my hubby’s birthday. Flavor was amazing. The frosting was tasty as well. The cake fell substantially after cooling. Texture was odd. Too much liquid? What size lemon cake mix? Disappointed, followed all the instructions correctly and considered the comments. Cake still fell and stuck to the Bundt pan after spray shortening and flour.